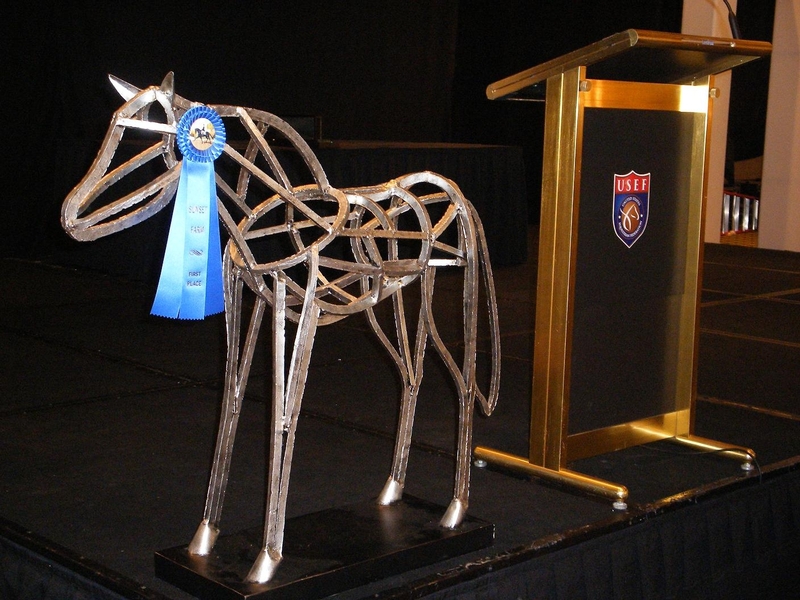 The USEF had their 2010 Annual meeting this year in Louisville, Kentucky. Rochelle and Jessica were there to represent Hodges Badge Company and meet with the attendees. As the Official Ribbon Supplier of the USEF, Hodges was proud to meet the directors of the multiple breed and discipline associations that attended the convention’s meetings. As everyone headed to registration or picked up lunch they walked by our award display and had the opportunity to stop and say hello. It was good to hear that so many people were very familiar with Hodges and our products. It was also good to be able to show them new products that everyone seemed excited about. One being the Pewtarex plates (check your 2010 Equestrian catalog [hitting the ground March 1] for details). Perhaps the best part of the trip for Rochelle and Jessica was that they attended the Pegasus Awards, a huge banquet honoring the stars of equestrian sports. They watched as dressage rider Steffen Peters was named Equestrian of the Year, and Olympic rider and Chef d’ Equipe Jessica Ransehousen was honored for her lifetime commitment to the sport.